It is difficult for the ownership of a tangible item of personal property to be involuntarily lost. Ongoing ownership is not tied to use of an item. It is generally thought, though, that ownership can be voluntarily abandoned. Abandonment then frees up an item to become owned by another. Although a registered trade mark is a species of personal property, the law regarding the loss of ownership and “re-ownership” of a registered trade mark, diverges from this general personal property model. This article explains this divergence, and how registered trade mark law’s different approach to re-ownership is caused by the recognition of other independent protection mechanisms for trade marks. The article then critically evaluates the law’s current operation concerning loss of ownership in light of the position under personal property law and the underlying justifications for trade mark protection. This article explains how blockchain platforms – the technology underlying Bitcoin and other cryptocurrencies – are likely to affect copyright law. After briefly outlining the technical features of blockchain technologies, it examines five main areas where copyright is likely to be affected – in registration processes, the creation of open digital rights management systems, the development of automated licensing, the reduction of the need for collective management organisations, and the identification of orphan works. Following the Full Federal Court’s decisions in Actavis Pty Ltd v Orion Corp and Bristol- Myers Squibb Co v Apotex Pty Ltd, s 120(1) of the Patents Act 1990 (Cth) is widely understood as precluding non-exclusive licensees from becoming a party to infringement proceedings. This article contends that, as s 120(1) refers to the “start” of proceedings, rather than “standing” (or an analogous term), it should be interpreted as only restricting the parties that can commence infringement proceedings. It is argued that this provision does not prevent non-exclusive licensees (and other appropriately interested parties) from being joined as a plaintiff to infringement proceedings that are already on foot. In addition to overcoming the well-known practical difficulties introduced by Actavis and BMS, this interpretation better reflects the language and policy objectives of s 120(1) and the Patents Act more broadly, as well as the Federal Court Rules 2011 (Cth) and other intellectual property legislation enacted by the Commonwealth. 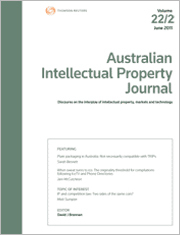 For the PDF version of the table of contents, click here: AIPJ Vol 28 No 4 Contents.